Here is the best way to make invisible ink marked cards Modiano Piacentine luminous marked cards. Red and black cards can be perfectly marked with our best invisible ink pen with glasses. Usually big font and suit will prefer and place in middle. All of them can be marked as poker cheating lenses cards, and infrared contact lenses marked playing cards. In addition, they can be bar code marked deck, to work with poker analyzer scanner system, the poker winner predictor that can tell you who are the first winner and second winner, and report the cards 1 by 1 from bottom to top, or from top to bottom. 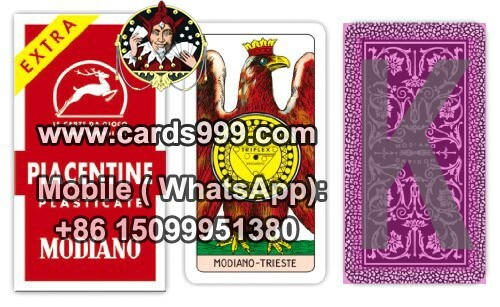 This Modiano Piacentine deck of cards is an authentic deck of Italian original playing cards. Italian playing cards most commonly consist of 40 cards (4 suits from 1-7 and 3 face cards). The three face cards in each deck are the King, Cavallo (Calvary man) and Fante (Infantry Man), except in the French region (see below) which uses a Queen instead of a Cavallo. Playing with Italian marked playing cards gives any player a wonderful historical perspective on this great country. Don't worry if you don't know any Italian Games. We send out free instructions for 2 of Italy's favorite games: Scopa and Briscola.